Good morning. There's a ton going on today! 1. It's all about Japan: The Bank of Japan has shocked global markets by boosting its aggressive stimulus program in an effort to keep the country's economic revival on track. Japan's Nikkei index surged by nearly 5% to hit a seven-year high and stock markets around the world are rallying. Asian markets closed with significant gains and European markets have jumped by at least 1% in early trading. U.S. stock futures were also surging by more than 1%. "The move by the Bank of Japan was not only unexpected, but shows the divergence between the major central banks around the globe as the Federal Reserve has just ended monetary stimulus and the Bank of Japan is speeding up the printing presses," said Angus Campbell, a senior market analyst at FxPro. 2. Stock market movers -- Starbucks, GoPro, Citigroup: Shares in Starbucks (SBUX) are taking a tumble -- down by about 3% premarket -- after the company said it expects profits will fall short of expectations during the next three months. Shares in GoPro (GPRO) are surging by about 15% after the company reported a better-than-expected third quarter and issued an upbeat forecast for its business. Meanwhile, Citigroup (C) shares are off by about 1.5% premarket after the company said it had to revise its third quarter earnings. The bank said profit was $600 million lower than previously stated due to higher-than-expected legal costs. 3. Earnings: There are plenty of earnings to watch Friday. Anheuser-Busch InBev (AHBIF), Chevron (CVX), Clorox (CLX), and Exxon Mobil (XOM) will report earnings before the opening bell. Overnight, Sony (SNE) reported a second quarter net loss of $1.2 billion, and the company confirmed it's on track to lose a staggering $2.1 billion this fiscal year. Shares edged higher, but missed the rally that other Japanese stocks enjoyed. 4. Economics: The Bureau of Economic Analysis will post monthly personal income and spending numbers at 8:30 a.m. ET. The University of Michigan will report the final version of its monthly consumer sentiment index at 9:55 a.m. ET. 5. Thursday market recap: U.S. stocks closed higher Thursday. The Dow gained 221 points. 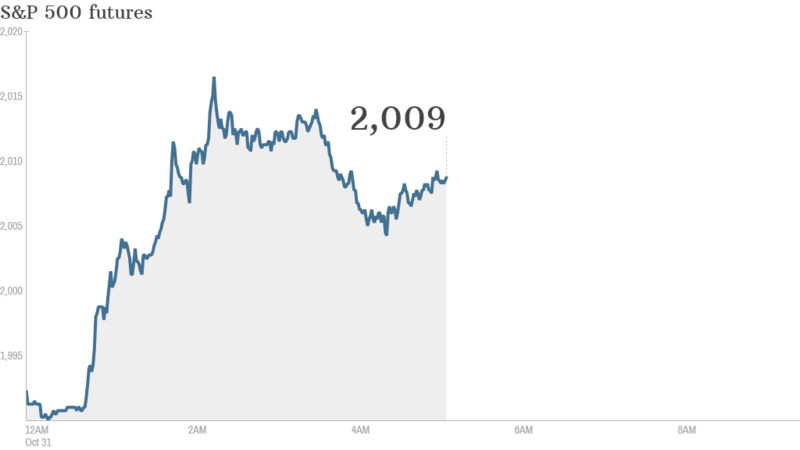 The S&P 500 closed 0.6% higher and the Nasdaq moved up by 0.4%.